Société Des Produits Nestlé SA and Nestlé Singapore (Pte) Ltd (plaintiffs) filed an action before the Singapore High Court against Petra Foods Ltd and Delfi Singapore Pte Ltd (defendants) for trademark and copyright infringement. SGHC 252. 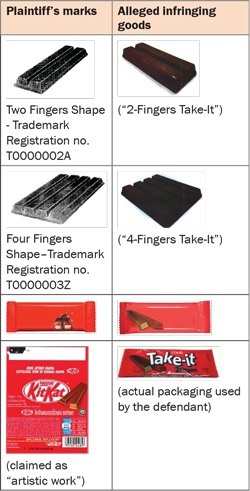 The Two Fingers Shape mark is well known and/or well known to the public at large in Singapore and the defendants should be restrained by injunction from using said shape mark in its 2-Fingers Take-It product. The plaintiffs’ threats of legal proceedings for infringement of a registered trade mark were groundless threats of infringement proceedings under section 35(2) of the Trade Marks Act. In examining the claims and counter-claims, the Court took the view that even if the defendants had copied the plaintiffs’ product, there was nothing wrong with copying per se as long as the plaintiffs’ rights were not affected. The defendants thus succeeded in establishing that the plaintiffs had not used their registered marks in a manner that is consistent with the essential feature of a trademark, such as: to act as a badge of origin for the products in question. Therefore, the plaintiffs’ claim of trademark infringement failed. The plaintiffs’ claim that their marks were well known to the public and/or to the public at large in Singapore was also rejected. This decision is significant, as the High Court clearly articulates that shape marks that are necessary to obtain a technical result are unregistrable and such unregistrable marks will not be afforded protection, even if they are well known in Singapore or anywhere else in the world.